Yipee! Finished my first pair of knitted socks! 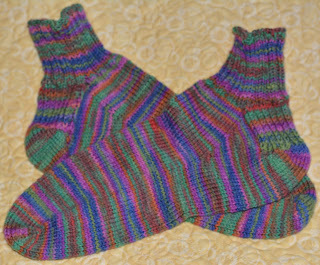 It will be a present for my mom, so I hope she likes this colorful rendition of a traditional pair of socks. 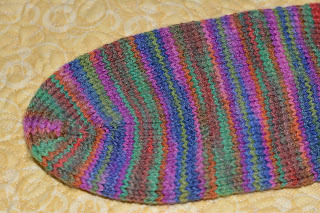 Here are the specs: knitted from toe up with circular needles (KA size US 2 - 2.75mm), with Saki Silk yarn by Wisdom Yarns (55% fine merino superwash, 25% nylon, 25% silk). It is sooooo soft and comfortable! I will need to mail it to Brazil right away before I change my mind and start wearing it, particularly with this cold weather we are having in Utah. 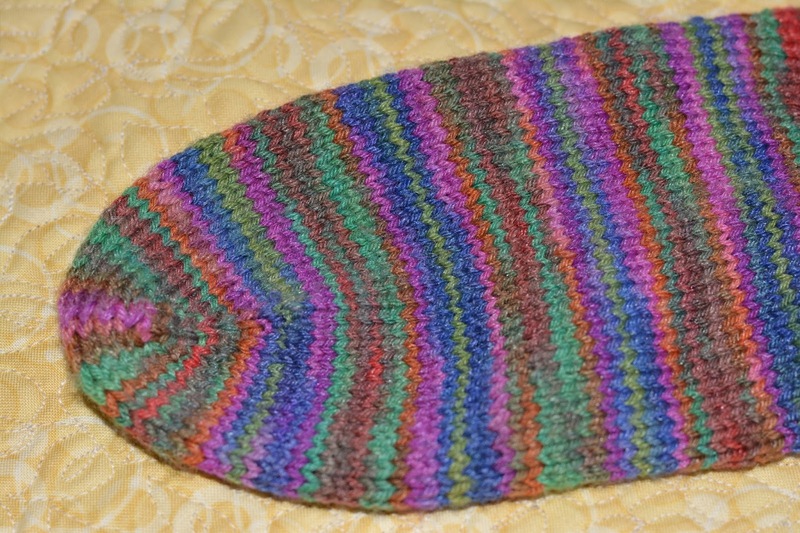 I really like the colors of the yarn and how the project looks after you knit with it. I have another skein of the same yarn in a different color scheme for my next pair, which I will start right away. The cast on is done using the Turkish or Mediterranean method - easy. The pair is knitted at the same time, although the heels are knitted separately: do one foot, then the other, then finish both feet. I enjoy working with circular needles... no seams! This is my finish for today. I am a happy camper ! Congratulations!!! Doesn't it feel SO good to finish up your first pair of socks? There's that amazing "I Did It!" feeling that is like no other :*D You did a great job too! Love them Denise. They're so cheery. I have been wearing my wool hand knitted socks the last two days. You definitely need to knit a pair for yourself. Excellent sharing! I fully hopeful that this site help us for various part of silk .See more silk base closure amazon An excellent solution which can be found for anyone who is suffering from the damaged scalp and hair issues is the silk base lace closure.